Germany, Denmark pay 3 times current U.S. rates for energy — and our leaders want us to pay that much as well. Although blades on the 150-foot wind turbines at the new German offshore Riffgat power plant 9 miles off the North Sea island of Bokum are finally turning, there is one big problem. They are doing so only because they are being powered by onshore fossil-fueled generators to prevent the rotors from corroding in salty air. And why might that be? Well although they otherwise function perfectly, the underfinanced grid operator hasn’t yet connected a power line because of problems attracting investor financing. 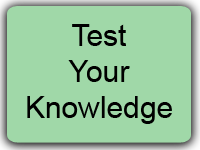 Prospective investors attribute their reluctance to a lack of market confidence. 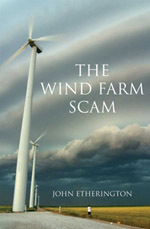 Wind farm stooges say: cars, cats, windows, etc. kill more birds than wind turbines. Using the same logic, the asbestos industry could be reborn! It would just have to say: my products kill fewer people than car accidents. Wouldn’t that be fun! All they’d have to do is finance electoral campaigns left and right, and the corrupt system would do the rest. It may be true, at this stage of the game, that wind turbines kill less birds than do cars and cats. But they kill rarer birds, and twice as many bats (which cars, cats, windows etc. don’t kill). In addition, they are on their way to killing 20 times more when the number of turbines is multiplied by 20, as are planning the wind industry and their gnomes. 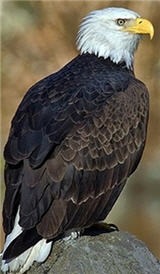 Does fatal attraction of hirundines to wind turbines threaten populations and species? 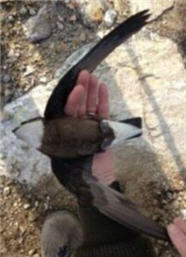 The fatal impact of a white-throated needletail with a wind turbine in Scotland (1) raises serious concerns, with ramifications far beyond the sad loss of a single, spectacular vagrant. As a rare visitor, this individual bird was being very carefully observed, and thus there was a far higher chance of a turbine impact being detected than is the case for most small birds. Only a minuscule fraction of birds are intensively monitored in this way, and if the movements and fates of many other individual birds were being monitored, then what appears to be a rare event might prove to be frequent – or indeed probable. The death of this needletail should remind us that numerous small birds are being hit by turbines without detection or raising alarm. However, other hirundine deaths have already been documented amongst Europe’s wind turbines (2). The needletail encountered a small, lone turbine. On the face of it, this is highly unlikely – unless the bird was actively attracted to the vicinity of the turbine. Indeed, some insects are attracted to wind turbines, and some bats are attracted to their deaths by unknown features of the turbines – possibly the food concentration around them (3, 4, 5). Remarkably, there are reports of bats commuting to wind turbines up to 14 km offshore for such food resources, as well as others stopping, perching and feeding around them during migration (4). This attraction exerted by wind turbines extends their ecological footprint to new, unsuspected dimensions. We hypothesise that hirundines (including swifts, swallows, martins, swiftlets and needletails) might also be attracted to insects flying around these machines – onshore and offshore. Indeed, awareness has already been raised about the potential attraction of insectivorous birds to wind turbines (5). Reports (5, 6) that hirundines can comprise a third of turbine victims in Sweden and are being killed by domestic micro-turbines in Britain merit further investigation. Another consideration is that certain landscape features and air flows might attract both wind farm developers and hirundines, putting them on a collision course as they do with raptors. We propose that wind turbines, let alone wind farms, may create extensive population sinks which could deplete and exterminate populations of birds and bats. We doubt the woeful amount of independent monitoring of turbine impacts would be capable of detecting this threat in most regions or for most species. In the circumstances, a precautionary approach would be particularly appropriate in areas with populations of already threatened endemic hirundines, bats and other species – as in Seychelles or the Mascarenes for instance. For such areas, irreversible global extinction might be caused by wind turbines, yet even the highest standards of monitoring (including videos and radio transmitters) might be insufficient to alert us in time. We predict the extinction legacy of wind turbines will become an increasing source of concern, as ecological traps are set in vast numbers across the planet. 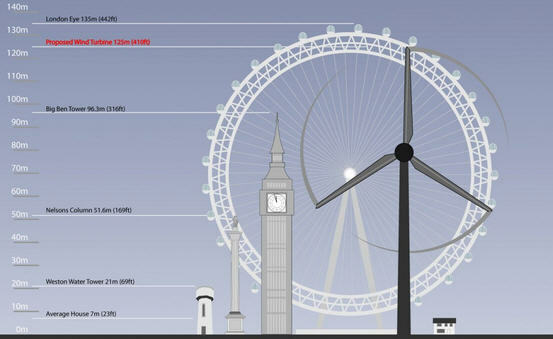 1) Wind Turbines can measure more than 150 metres (487 feet or 48 stories) tall and weigh in at 600 tons. 2) The extremely low air pressure surrounding a wind turbine has been discovered to be the cause of the high numbers of bat deaths. A bat’s lungs are very delicate, and it seems the low pressure might cause them to expand to the point of bursting blood vessels. 3) Wind turbines emit an infrasound (below 20hz) and the corporeal effects of this sound vibrate the eardrum. Infrasound cannot be heard but can be carried through the atmosphere for thousands of kilometers and is believed to cause certain breathing and digestive problems in humans and animals. 4) Wind turbine blades can rotate at up to 80 meters per second, or about 180 miles per hour. 5) The largest wind farm in the world, as of 2012, is the Alta Wind Farm in California, with 390 wind turbines and a projected capacity of 1550 MW by 2013. 7) The largest offshore wind turbine ground-to-tip height is 197 metres, more than twice that of the Big Ben clock tower in London. 8) Commercially sized turbines have a capacity of up to 5 million watts. In order to convert wind energy into electricity an average wind speed of 14 mph is required. 9) Hawaii houses the largest wind onshore turbine in the world. It has rotors that are the entire length of a football field. The turbine stands at 20 storeys high. 10) The Siemens SWT-6.0-154 is the largest offshore wind turbine, that is being tested wind turbine testing facility in Østerild, Denmark. 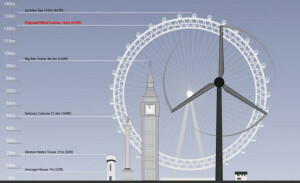 The turbine boasts the world’s largest rotor with blades 75 metres long, larger than the wings of the world’s largest aircraft, the Airbus 380. They are the world’s largest fiberglass component, that is all one piece.